Here is my completed Sugar Plum Stars UFO #9. Looking forward to June's project! 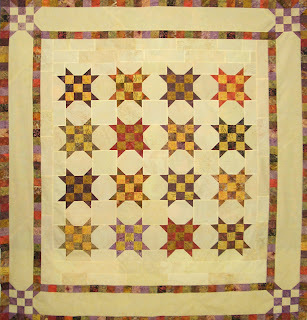 Check out all the other completed projects at Patchwork Times. I absolutely love it! I have got to make a Sister's Choice. Every time I see one I am reminded how much I want one of my own! Good Job! Great finish...I love the sister's choice block! Sugar Plum Stars sure came out nice. I like how the center is framed and you are drawn to the corner blocks. Love the colors. Five UFOs done...seven to go for 2011! Next year you'll have to have a Kerry's Quilts Quilted UFO Challenge. I bet you have 12 put on that list right now!